Look at how well this piece blends with the Fall 2017 Pantone colors!! I'm sorry that I can't give you links to all of these exact beads...you'll see why when you read the story of this piece below! You'll just need to look for trade beads and glass Czech crow beads (the tans, reds, and browns are the best for making a piece like this). 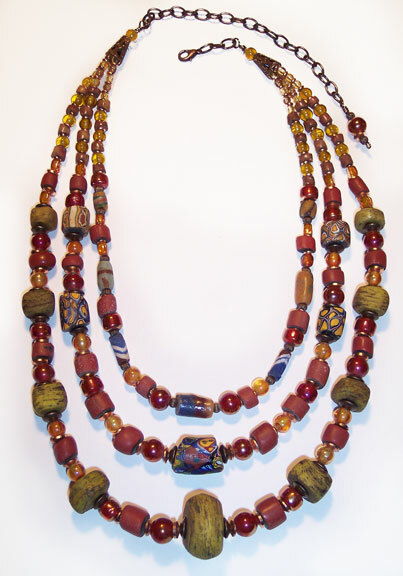 Out of Africa is a HEAVY necklace...not for the faint of heart!! I used a lot of different African trade beads that I've collected over the years, including some that my sister-in-law brought back for me from her trips to Africa. There are glass mosaic beads, brick red glass greenhearts, pipestone, and sandcast glass beads. I haven't been to Africa, but I've always been fascinated. The large tan beads on the outer strand are wound-glass beads, originally made in Hebron, Palestine, centuries ago. The glass makers moved on to several other spots, including Egypt and Turkey, and the beads are still made. These are probably 200 to 300 years old. Not as old as some, but still pretty nifty! The inner strand adjusts from 18 to 23 inches; the outer strand moves along with it from approximately 25 to 30 inches. The chain and hook set are natural brass.